Does Fantasy Sound Better with a British Accent? The BBC have got an interesting article up today discussing the fact that many characters in fantasy film and TV productions talk with British accents. They cite The Lord of the Rings films and TV adaptation Game of Thrones as examples where most, if not all the voices are British. 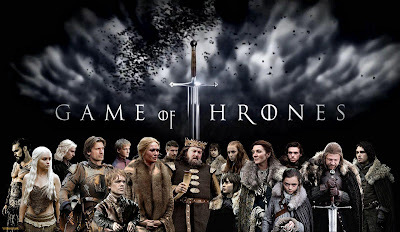 Indeed in Game of Thrones, Peter Dinklage is singled out as being the only US actor who, for the show, puts on a very convincing RP (Received Pronunciation) accent – very apt for a Lannister. To my British ears, these shows would just sound wrong to me with US voices, and I say that as someone who generally prefers US TV shows to British ones. However, in using British accents all of these productions face another problem with the use of regional accents. In The Lord of the Rings the hobbits all have different accents, suggesting they are all from very different locales. In Game of Thrones the voices in Winterfell are all essentially from the North of England, but even amongst those there seems to be a mix of Yorkshire, Lancashire and a bit of Scottish. What's the US perspective on how they sound? 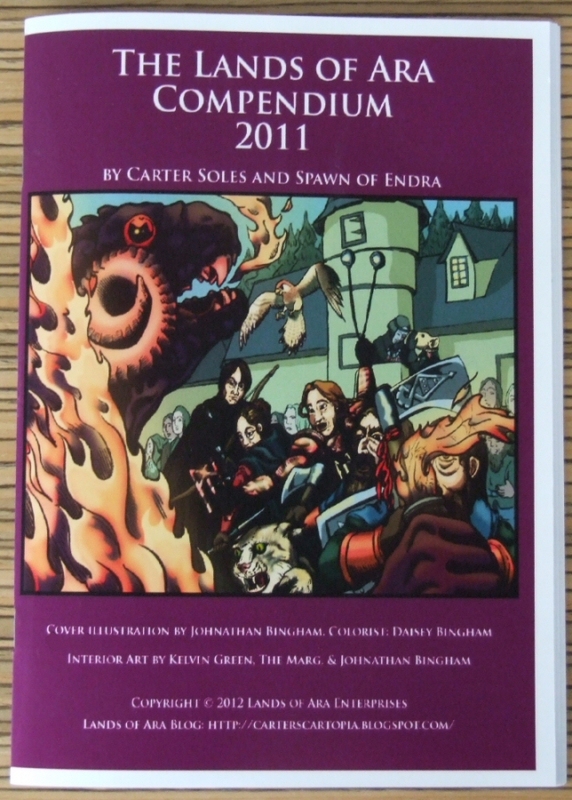 Last weekend saw the launch of The Lands of Ara Compendium 2011 which may be downloded as a free PDF here. 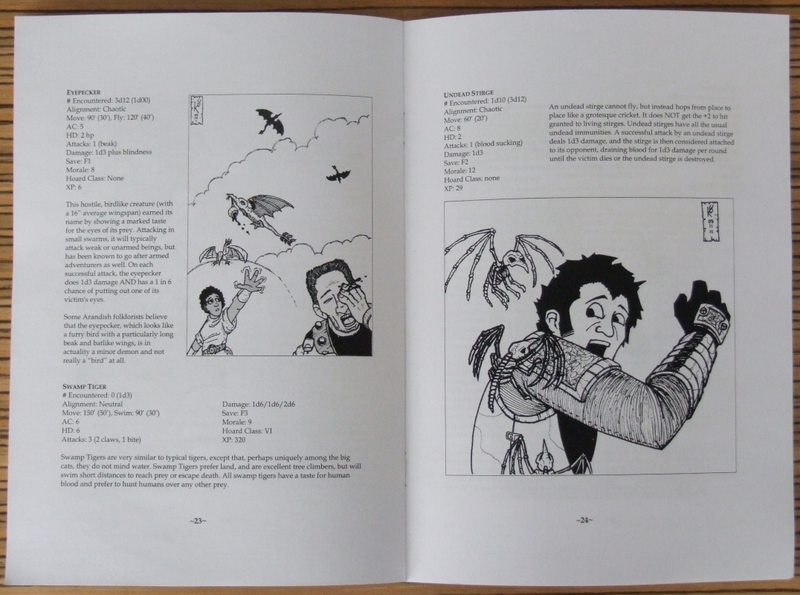 It's got 40 pages of classes, monsters, spells, and stuff for the taking. 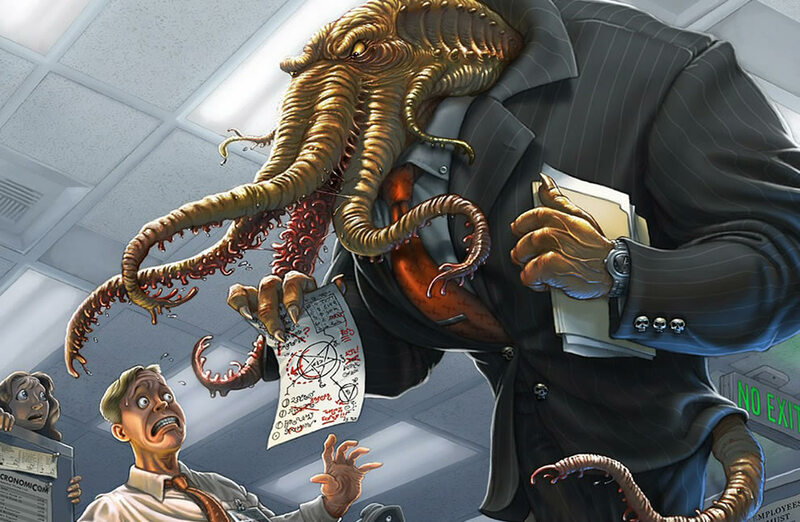 Carter Soles and Spawn of Endra have done a great job editing material from over two years of blog posts. The PDF is US letter sized, but as I have a duplex printer, I opted to print it as an A5 booklet which produced a very nice, and still easy to read, zine-like publication. 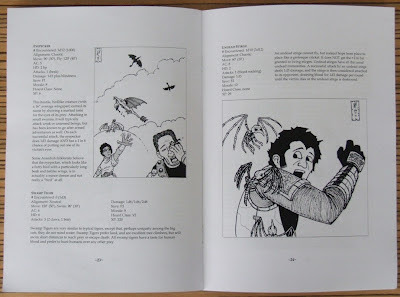 The Compendium also includes lots of great art by Jonathan & Daisey Bingham, Kelvin Green, and our very own The Marg. ... when you download and avidly study an article on crocodiles as prep for the next game. We had a great Stonehell session on Saturday, and managed to dispose of all (we hope) the lizardfolk on level 2 and take their shinies. 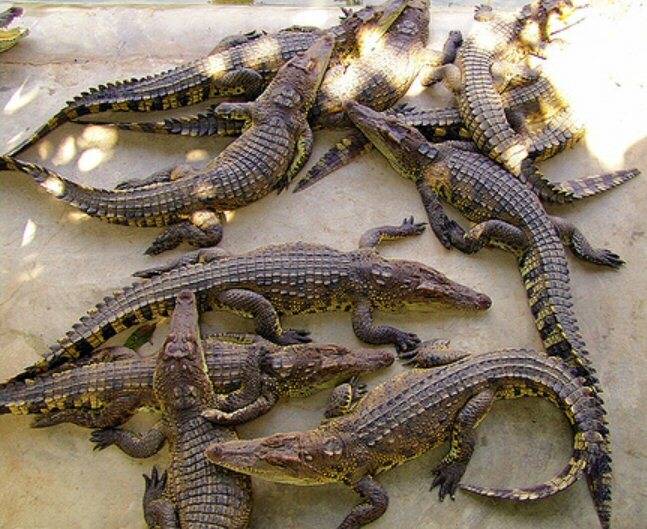 We wisely decided to leave their 8 pet crocs undisturbed, but now we're wondering whether we could drive them into the neighbouring hobgoblin area before we start exploring it. One of the things I hoped to be able to do by having my iPad, was draw for the Monster Book in the evenings(my big computer is at work). I'm continuing to practise in Sketchbook Pro, and here are my latest offerings. We might use the close-up wraith illustration in the Monster Book and the full length wraith will take its place as a contender for the next Oubliette Compilation (Issues 5-8). I realise I seem a little undead-centric, but this might be a result of watching The Walking Dead, which continues to be one of my favourite leisure-time programmes. I sneaked a quick 10 minute go on Marg's iPad today, to try sketching a dungeon map with it. 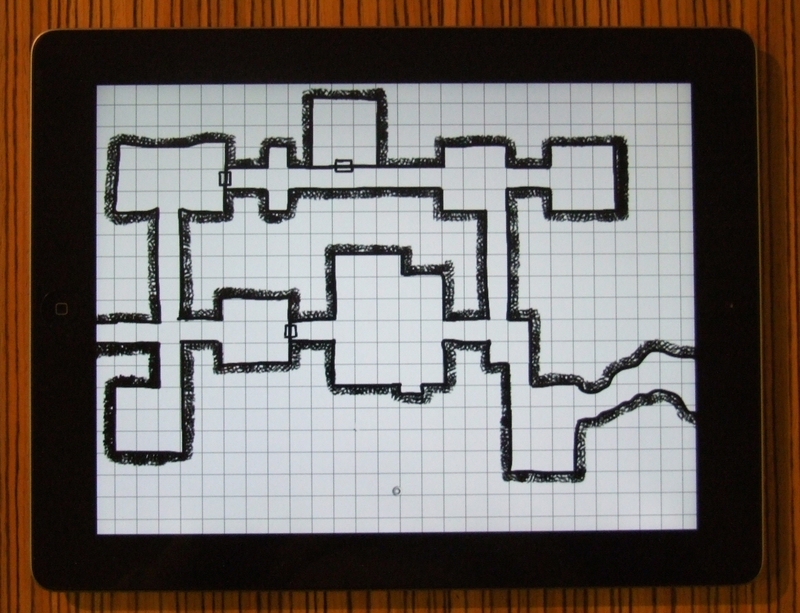 The maps in Oubliette are usually one of the last things I do, and they are often rushed creations in GIMP or Paint Shop Pro. Given time, I know I could do a much better job on them, but it never happens. 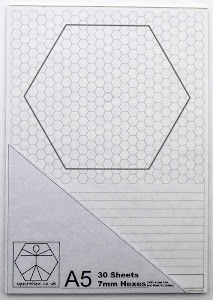 When I write and play-test the adventures, I normally use quick hand-drawn pencil maps on squared paper. Today I surprised myself, by producing a digital map in the same time it normally takes me to draw one with a pencil. I used Sketchbook Pro to draw it, which is well worth its £2.99 price tag if you want a drawing app. I'll have a go at some more maps over the next week or so and refine the style, but I think there's a good chance that most of the maps for the next issue will be drawn on the iPad and look all the better for it. Marg got her new iPad earlier today. Having not owned an earlier model iPad, the whole family have spent most of the afternoon trying to get a go on it. 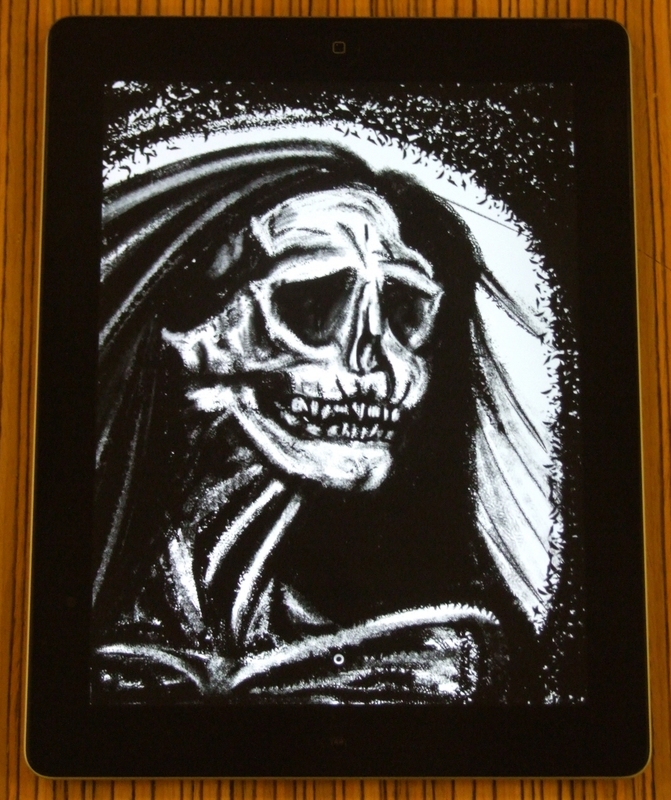 Once she had a proper chance to try it out as a drawing tool, she mangaed to produce this charming portrait of a generic undead type fellow in just under half an hour - not bad for a first try. She's using a drawing app called Sketch Book Pro and a Wacom Bamboo Stylus. Are Gaming Companies Nice Places to Work? I've read with interest the RPG industry related blog posts this week at Howling Tower and Hill Cantons. They got me thinking, are Gaming companies nice places to work? My only experiences in the games industry are limited to a couple of stints of work experience at Games Workshop's Design Studio in the late 1980s. That was a time of immense change in the organisation, and employee morale was pretty low (one of my friends also ran one of their stores around that time and often recalls how dreadfully the retail staff were treated too). I'll have to write up my experiences there sometime as I got to work in a lot of different departments there. "If the way you behave and the attitudes you display fit with Games Workshop's ideals, it is highly likely you will be successful, well rewarded and happy. However, it is only fair to say that people who don't fit with our culture, or who play at fitting, will be unhappy and consequently unsuccessful." Right that's enough on Games Workshop for a while - I don't want to sound bitter. This article (found on the BBC website this morning) caught my eye. 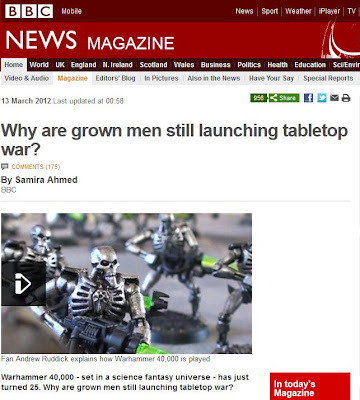 It concerns Games Workshop and Warhammer 40K. The comments make interesting reading. 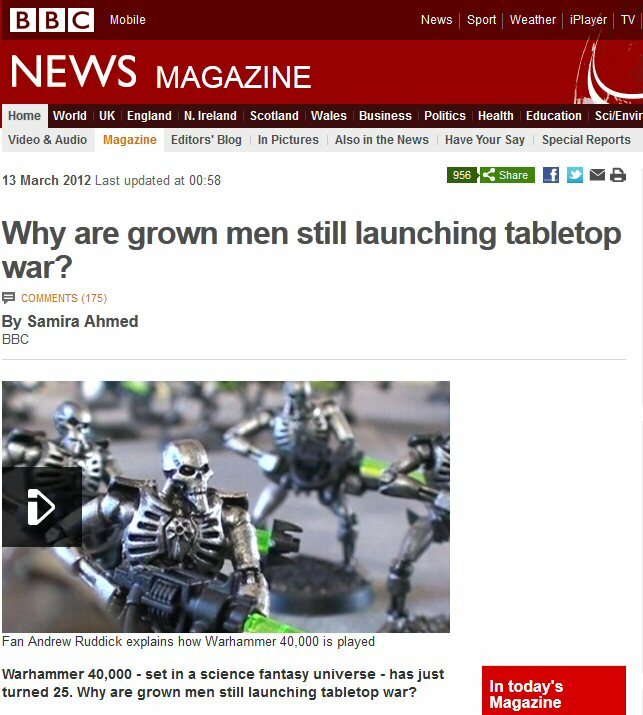 There's no denying that the Warhammer fans enjoy their games, but I can't help thinking that if they sat down with an experienced GM for a couple of hours they'd get bags more enjoyment playing an RPG.